It's mid-February and early morning in Vallejo, Calif.
Westringia is blooming along a walking path near the Glen Cove Marina. Suddenly out of no where, there's a flash of yellow and black. 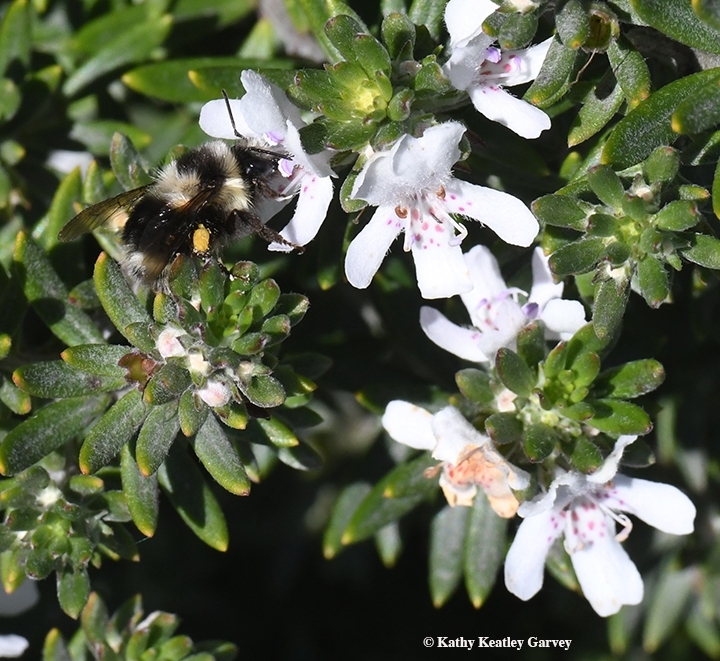 A black-tailed bumble bee, Bombus melanopygus, buzzes by our camera and heads for the Westringia. Good choice. The Westringia, a genus in the mint family and endemic to Australia, is a late-winter blooming plant that provides nectar and pollen when just about nothing else around does. It's tough. It can take it, whether it's the California drought, heavy rains, hot sun, or cold temperatures. And here, near the Carquinez Bridge, it forms a healthy hedge of white flowers and light gray-green leaves. And it's blooming profusely, beckoning bees. Bombus melanopygus is the kind of bee that lingers not. One minute you see it, the next minute, it's gone. It knows what it needs, where to get it, and how long to stay to elude those predatory wasps. That brings to mind the recently published research from Queen Mary University of London that indicates that bumble bees not only possess complex navigational skills, rudimentary culture, and emotions, but they can even use tools. Tools! It's fairly well known that bumble bees can learn to pull a string to get a sugary reward by watching other bees perform the task. Now Olli Loukola, a behavioral ecologist at Queen Mary University of London, says that in the UK study, bumble bees pushed around a small, yellow ball to a specific target to get a sugary reward. 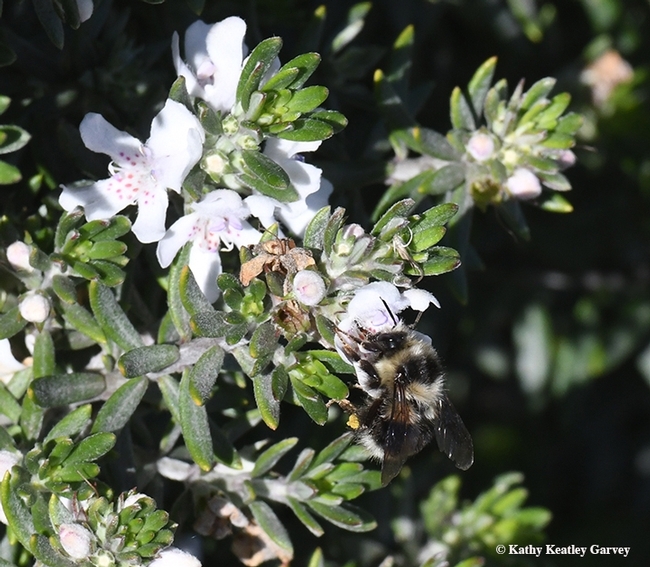 Of course, bees in the wild, including those buzzing around the Westringia in Vallejo, don't pull strings or push balls, but they do shove aside the flower petals to get at that sugary reward--nectar. The bumble bee brain is about the size of a sesame seed, but if you say it has a "bee brain," that would not do it justice. Check out the video and news story on the Science journal website.